I’ve been very fortunate to find many kindred spirits here on WordPress who love art, photography, flowers…and Beth, of Beth’s Floral Photography and Smiling to Life (Betulaworldpress.com) loves all three, and is a lovely person, to boot! 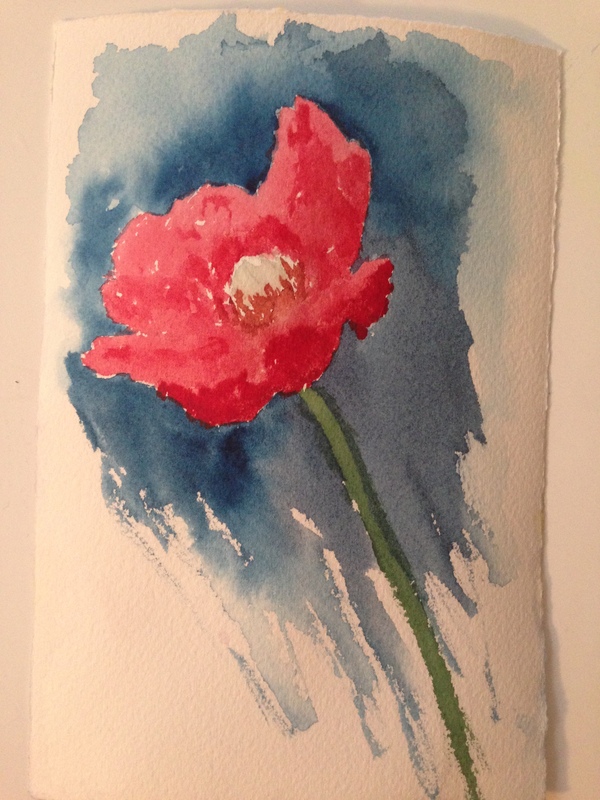 Beth graciously gave me permission to paint an image of poppies she photographed from her own garden. The images can be found here. Beth has over 100,000 images (!!!) in her collection, and you can find her work for sale at this link, as well. These are amazing images, truly. Thank you most kindly, Beth! I’m still working on my florals, and particularly in watercolor, they present a challenge. I was about to sign this one off as an art fail, but Hub said I should post it. So here it is. I hope to improve on it next time out! Happy Friday to one and all, and do I need to mention tail feathers?! I didn’t think so. Peace, and Happy Weekend ahead! Don’t forget Draw A Bird day tomorrow, for anyone who’d like to join in! I like the way you’ve done the poppy all in tones of red. Lots of dimension, but coherent. And I haven’t forgotten Draw a Bird day! I look forward to seeing everyone’s choices too. Man, flowers are tough. Thanks for your comment. It didn’t help at all that I did the drawing in pencil and lost the lines. I just felt ink would be too strong and spoil the final effect (if indeed there is one). Hi, draw a bird is August 8? Is there a site where one would post a bird? I’d like to participate. Poppy is fab! Hi Beverly, I’m on my tablet right now but I believe if you check out my cardinal post from yesterday, that one should have a link to A-Wing and A Way’s original post about the official DAB day on April 8. We all enjoyed the first one so much and many of us didn’t know til it was too late…..so I thought it might be cool to draw a bird on the eighth of every month and lots of people liked it, so I just keep the torch carried on, so to speak. This month I do plan to make a post afterward to everyone who participated so we can all see each other’s work. But you’d just post your bird on your blog. There’s no communal place to post it. Although that would be cool! Okay I look forward to a little birdy time today!! Maybe I will go spy on the nest in the fern I’ve been following. Nice! Sounds awesome! Can’t wait to see what you come up with! I really like this one. I find it very interesting. Wow, I’m glad. Thank you for saying so. Sometimes less is more – especially with water color. Hi Laura! I am speechless, honoured and humbled!!! Thank you so much. Correction: If my photos had a mind…. Beautifully painted, it’s the simplicity that I like. Really nice, background is perfect! If that’s a fail, then your successes should be in galleries! 🙂 It’s a perfect poppy! Teresa, thank you. You’re a great boost for my ego! I feel like it needs way more dimension and definition. I was tempted to add pen, but it seemed the hard pen lines wouldn’t go with a poppy at all. I’m glad you like it! Thanks, Teresa! I’m glad I made a good decision there. I have not yet decided on a bird, but I haven’t forgotten! I think this painting turned out really well! I like how the red flower stands out against the blue background. Thank you! Hopefully I can improve on it next time out. It was a joy to work from Beth’s photo. I’m looking forward to your birdie! Wow, thank you!! I’m really happy that someone notices improvement; I’ve been painting a lot and I felt like progress was really slow. Thank you so much! You’re welcome I have to give credit where it’s due! Honestly you’re putting me a little to shame as you’re doing way more work than I SHOULD be doing while battle that damned monkey! Lol! Lol, your stuff is beautiful and so unique. No one could ever hope to follow in your shoes (or I’d be trying)!! Keep it up, I love your stuff!! Thanks C! I appreciate it. Simplicity sometimes finds its own in the most spectacular way- wonderful painting Laura!